Both Rabotnichki and Shkupi got eliminated from the Europa League. 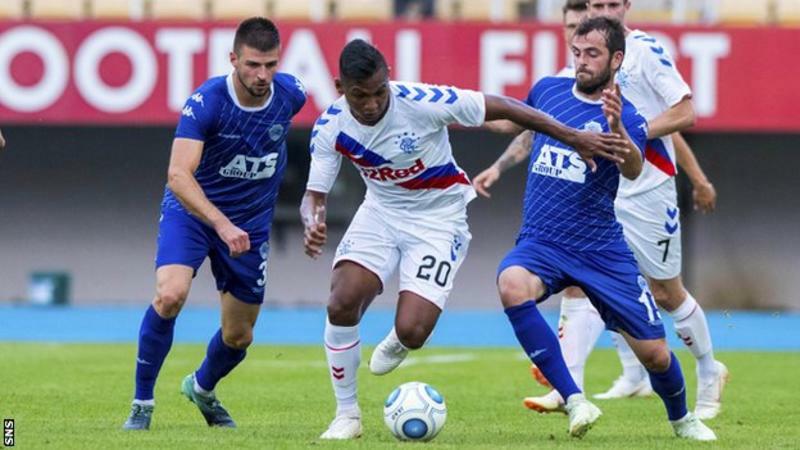 Shkupi had a mountain to climb after the 2:0 defeat in Scotland, but at least played a draw against Rangers in Skopje, while Rabotnichki despite winning in the first leg suffered a disaster in Hungary. After the 2:1 home win last week, Rabotnichki visited Hungary with a positive result and optimistic expectations regarding the qualification for the second round. In their advantage was even the fact that the game was played behind closed doors as Honvéd had one more game left from the stadium ban given by UEFA for fans troubles back in 2013. However, the team had a very bad start of the return leg in the Hungarian capital. The lead from Skopje was cancelled after only six minutes of play when experienced central back Dejan Mitrev made a huge mistake allowing Filip Holender to steal him the ball and score. Still not woken up from the bad start, Rabotnichki conceded a second goal, again from the same player who celebrated a brace. Not just that after only 16 minutes Rabotnichki was two goals down and had to attack in order to score and escape elimination, but the Macedonians weren’t even able to get the ball outside of their own half. It took them half an hour to come close to the home goal, but never managed to create a serious threat in the first half expect one free kick shot by Serbian international Ljubomir Stevanović. Interesting situation happened in the middle of the first half when main referee Ionuț Marius Avram injured himself and had to be carried away on stretchers. Fourth official Iulian Călin stepped in to save the match. After the break Rabotnichki started to play better, but in the 63rd minute Honvéd put an end to every hope that visiting players had left. Sebastián Herrera Cardona brought down Danilo in the box for a penalty kick and a direct red card for the Colombian international. Danilo took the ball and scored from the spot for a 3:0 lead. The Hungarians added a fourth goal in the 84th minute when Danilo dribbled past the visiting defense and scored. Honvéd: 99. Gróf; 26. Škvorc, 24. Kamber (C), 7. Batik; 3. Uzoma (68′ 33. Kukoč), 6. Gazdag, 9. Vadócz, 77. Nagy (86′ 14. Kovács), 13. Heffler; 11. Holender (84′ 96. Lukács), 19. Danilo. Rabotnichki: 1. Bozhinovski; 6. Еррера, 4. Mitrev, 23. Najdovski, 17. Stević; 11. Bopesu, 10. Stjepanovikj (C), 14. Peev; 7. P. Petkovski (71′ 99. F. Petkovski), 8. Stevanović, 20. Sharkoski (70′ 9. Chinedu). With a comfortable 2:0 lead from the first leg in Scotland, Rangers visited Skopje to give Shkupi a mission impossible. The home side was very active in the first half and had few serious scoring opportunities, but failed to make the final touch. The second half was no different. Both teams active, playing to score, but none managed to find the back of the net. The best chance for Shkupi came late in the 89th minute. Muarem was fast enough to escape his marker and one on one with keeper McGregor managed to beat him. However, on its was to the empty net, the ball was eventually intercepted by a visiting played, enough to deny Shkupi a late winner. At the end the match ended with a goalless draw which meant that Shkupi is eliminated. Despite the elimination, we can easily say that the popular pigeons never disappointed in the entire 180 minutes against the Scottish giant. Shkupi: 1. Zendeli (C); 16. Krivanjeva, 4. Bilali, 3. Tipurić, 88. Adem; 14. Broja, 19. Vujčić (76′ 9. Suhejlj); 15. Basilio (37′ 8. Shabani), 23. Stojkovski, 11. Muarem (90’+2 34. Ismaili); 18. Ilijoski. Rangers: 1. McGregor; 15. Flanagan, 19. Katić, 6. Goldson, 2. Tavernier (C); 8. Jack, 17. McCrorie, 21. Candeias (72′ 10. Ejaria); 7. Murphy (90′ 16. Halliday), 20. Morelos, 11. Windass (64. 40. Middleton).